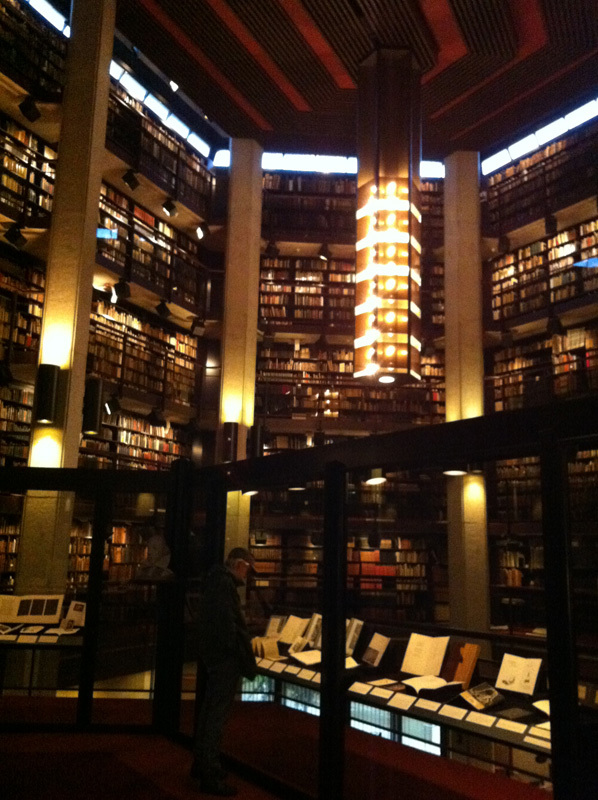 Five flights of WOW at the Thomas Fisher Rare Book Library, University of Toronto. Taken at the exhibition level, and imagine turning another 45 degrees in each direction and seeing more of the same. This past summer the Thomas Fisher Rare Book Library ran an exhibition titled “A Death Greatly Exaggerated,” referencing the famous quote by Mark Twain who, one day, was amused to read his own obituary. For the exhibit, it refers to the printed book about which we have all heard dire pronouncements and grim prognostications. It featured examples from private presses and small presses from the past half century or so, culled from the Fisher’s own collections. On the day that the exhibition was set to wrap, Saturday September 7th, the librarians decided to hold a show of private presses and small presses in the spacious room that literally lies at the bottom of a tower of books rising up five flights on almost all sides, these books being the Thomas Fisher Library collection — a collection that includes a First Folio of Shakespeare’s works, and a world-class collection of Alice books and ephemera. Yup, that’s Alice of Wonderland fame. Greyweathers Press was very pleased and honoured to have been included in this fine show. 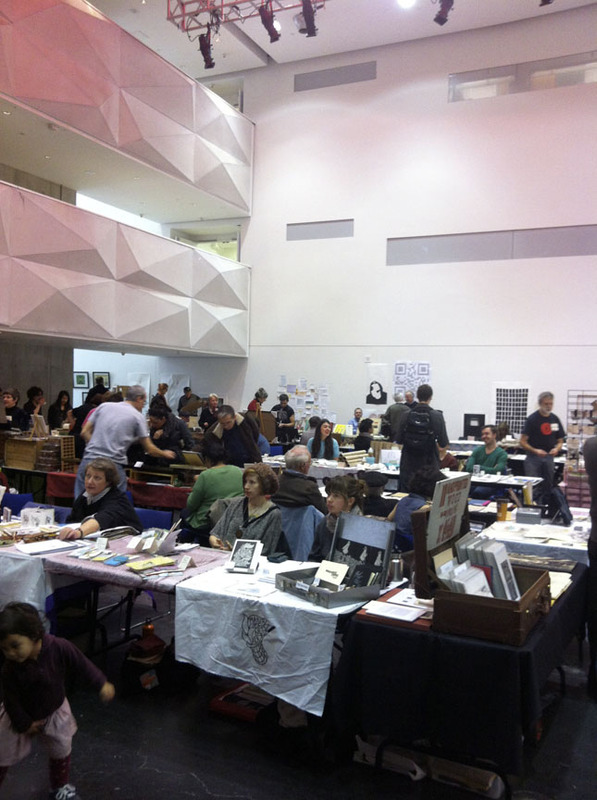 My small table was nestled between Alan Stein on one side and Hugh Barclay (Thee Hellbox Press) on the other. Other notables from the fine press community included George Walker (who some years back illustrated a limited edition run of Alice in Wonderland and Through the Looking Glass), Will Reuter of Aliquando Press, and Shanty Bay Press, amongst others. One thing I liked about this show was the presence of writers and publishers from the small press community. It made for a good mix, but reminded me how woefully ignorant I am of some of these presses, and of the important work they do to carry on a cultural and literary duty. Visitors to book arts show will know of Porcupine’s Quill, but also in attendance were poet-publishers such as Ottawa poet rob mclennan with poet-book conservator wife, Christine McNair. In spite of inclement weather, a steady crowd streamed through all day, and everyone seemed to have a good time. But the real star of the day was the venue – the rare book collection all ’round us while we talked about and sold our books. View from the show floor of the stacks, with Tintern Abbey on the left and Tenebrismo on the right, in the foreground. One visitor wondered if we (the exhibitors) had access to the books. I laughed, imagining the pandemonium that would ensue with two dozen crazed book fiends on the loose, were that ever to be permitted! 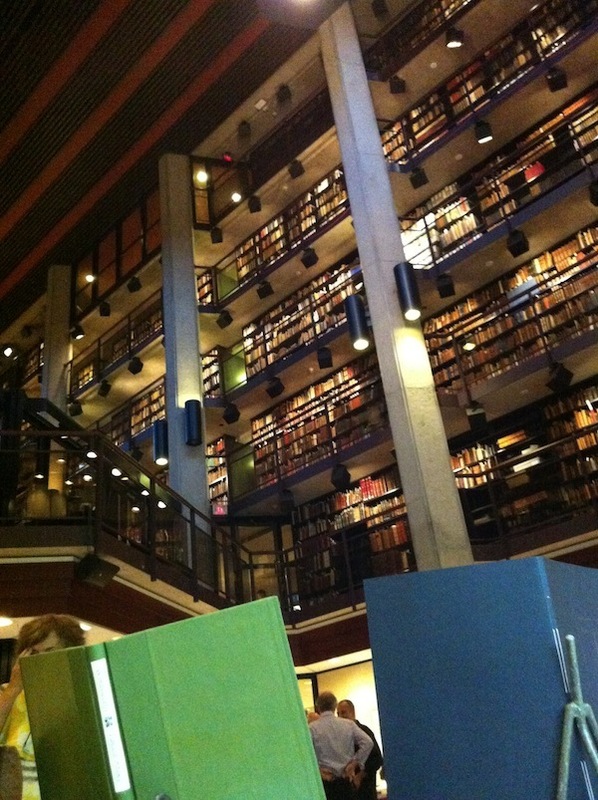 No, the stacks are, very correctly, secured from public access. Requests are directed through staff who then retrieve the books to be – depending on the book – examined in a supervised reading room.